Welcome to your new home/apartment/townhouse/dorm! Whatever it may be there are some essential things that every home needs and things that should be done within the first 24 hours of calling your new place home! I recently moved to Portland Oregon into a studio apartment with nothing, literally only 4 suitcases! We had no furniture, no basics, only clothes and memories! So starting from the ground-up is quite literally what I had to do for our new place. Sure I am still on the lookout for a few things like a full-body mirror, artwork, a cute dresser or bookshelf, but I am in love with our new studio apartment and everything that we have added to it so far. Now, the first day (24 hours) in your new place in intense - there are deliveries, furniture to put together, things to unpack, and furniture placement to figure out but there are still some items/task that will help to ensure that your first 24 hours runs as smoothly as possible in your new home. Don't judge me for suggesting that you need to deep clean your new apartment, but still do it. Plus this gives you an opportunity to inspect/take photos of any small things that you need to note down for your move-in inspection. If anything clean the places like door handles, the bathroom and cabinets in the kitchen. 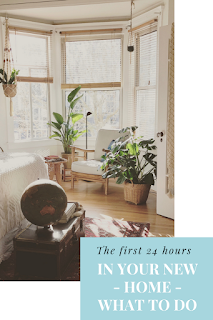 For your first day, there don't expect to have the Pinterest worthy home, you do however want to have a place to sleep, chill, and a few other main things that I found were needed for the first 24 hours in our new place. Below is a list of everything that I think you need for your first day in your new home! Throw Blanket and Pillows for the couch make a fantastic mid-afternoon crash spot because moving is hard work, so I found it necessary to have these! It amazes me how many people seem to think that in one day you can have your home all set-up and perfect! It takes awhile to figure out the best way to organize your kitchen cabinets or remember to buy stain remover for the laundry. While it would be ideal to have everything in your new home set-up, perfected, and ready for Pinterest within the first week, that just won't happen (or at least not as a poor recent graduate adult). It is ok not to have everything in its place or to need to head to the store multiple times throughout a week (we went to Ikea 5 times our first week here) because it takes time and living there to know what you need and what you don't need. So my main advice is to just enjoy it all! You will find the perfect throw blanket one day when shopping in Home Goods, or take 2 weeks to find your desk at Target and of course over a month till you realize you need a cheese grater to make your nachos (yes epic fail on my part). Making your new place an actual home takes time, but the best part about taking the time to figure it all out is making sure that it is your home and something that is right for you! Any tips that you have for a new home / how to survive the moving process?! Or is there anything that I left off my list? !